As if Restaurant Week wasn’t enough, Chicago also has a Chef Week sponsored by OpenTable. It’s a much smaller promotion than Restaurant Week, but there are a couple of tasty deals at $30 pre fix dinners. One restaurant that’s participating is Sepia, easily one of my favorite joints in town. So, last night, Yuki and I ate a delicious pre fix. My appetizer was the Scotch Duck Egg. It was a perfect croquet of ground duck meat, nice and medium rare after frying, coated in bread crumbs and filled with duck egg yolk that just oozed out when you cut it open. 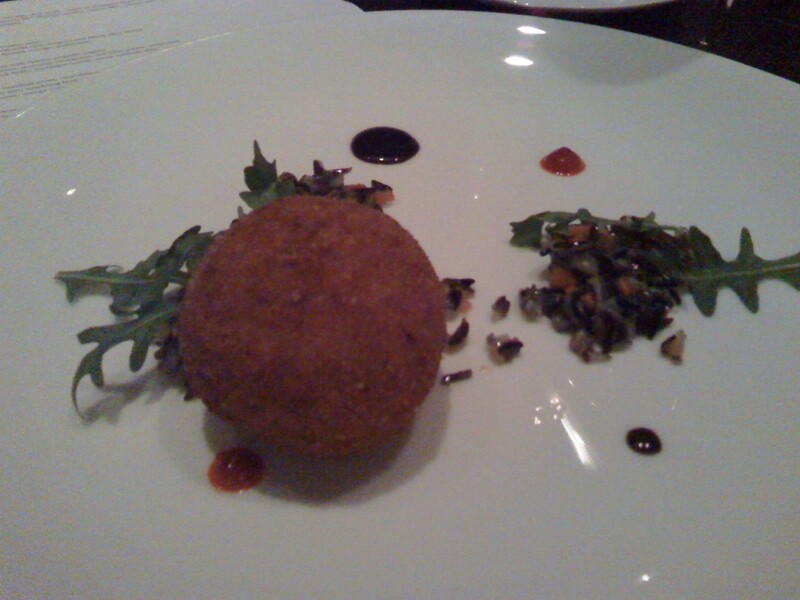 Chef Zimmerman served it with wild rice, arugula, and black olive honey. 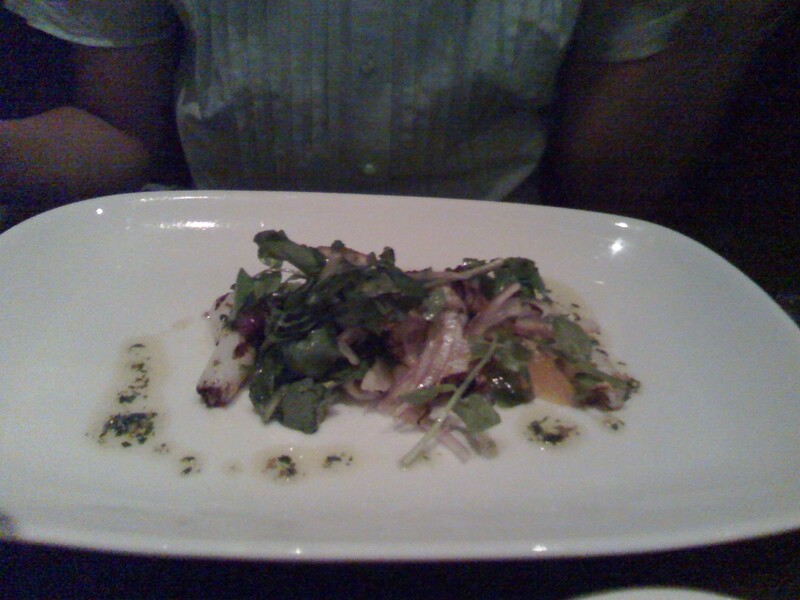 Yuki ordered the Grilled Squid. Perfectly grilled, nice and tender. It was served with cara-cara and blood orange segments, watercress, thin slices of red onion that’s been soaked to remove the sharpness, and herb oil. My entrée was Cider Braised Pork Belly with barbeque lentils and crispy cavalo nero (not sure what cavalo nero means, it was red cabbage in some kind of vinegar). 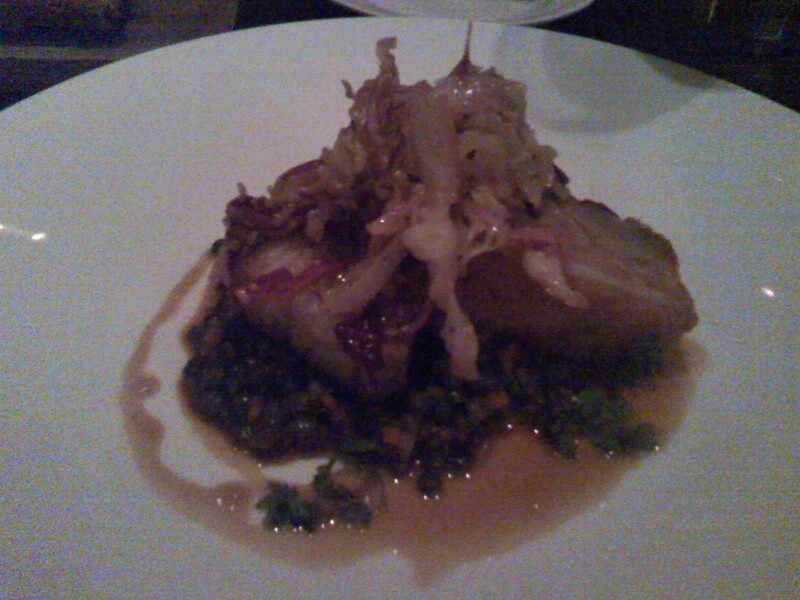 Delicious fatty pork belly! MMMM! The cider and bbq flavors really tasted like backyard cooking, but it definitely had an upscale, modern twist. The only thing I would have done different is to give the pork belly a quick grill after taking it out of the braising liquid. That would have crisped up the skin a little and added some smoke. It’s hard to argue with what was served though. 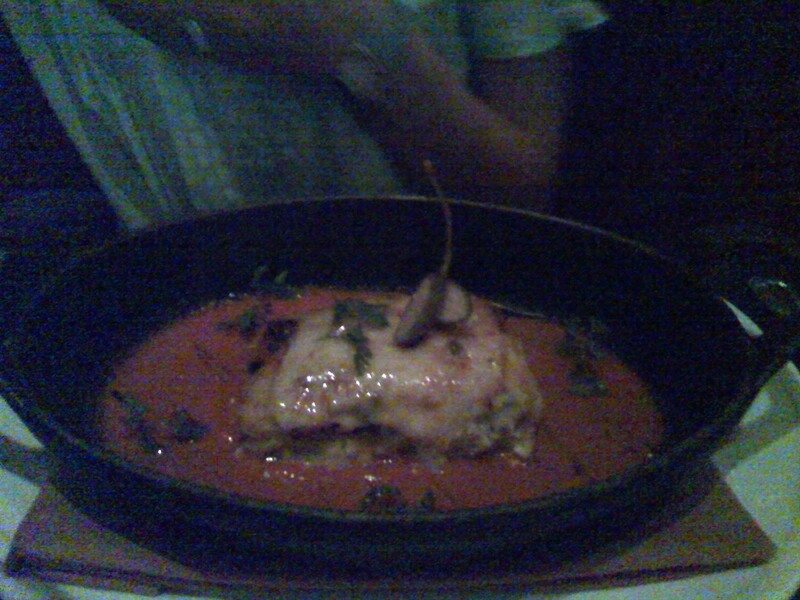 Yuki’s entrée was the Vegetarian Lasagna with herbed ricotta and piquillo pepper. The herbed ricotta cheese was brilliant with that tomato sauce. The piquillo pepper almost tasted like an olive, lending an interesting briny contrast. The noodles may have been slightly overcooked, but it was up there with the best lasagna I’ve ever tasted. For dessert I ordered the Maracaibo Mousse with mango ice cream and caramel-mango rum sauce. 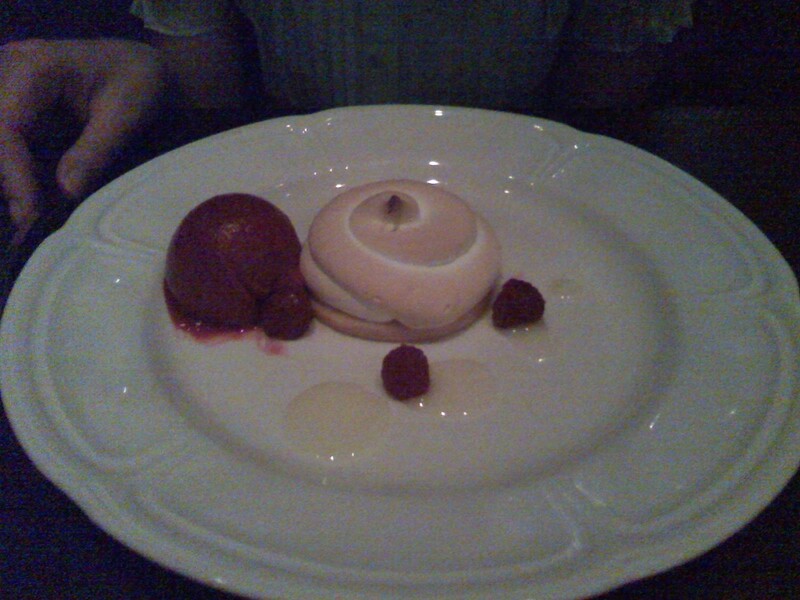 Yuki got the Citrus Meringue-Tart with champagne-raspberry sorbet and lemon sauce. While all of the individual components of both desserts were delicious, they didn’t all work out quite so well. The mango ice cream’s texture and overall feel were very similar to the mousse. There wasn’t much diversity in textures. On Yuki’s, the sorbet was more tart than the tart. Two tarts don’t make a match. We actually switched the ice cream and sorbet and the sorbet matched the mousse perfectly. While I wouldn’t say the mango matched the tart perfectly, it did offer a nice reprieve from the tart lemon. Maybe some sort of herb sorbet, like mint or basil, would have matched the tart better. 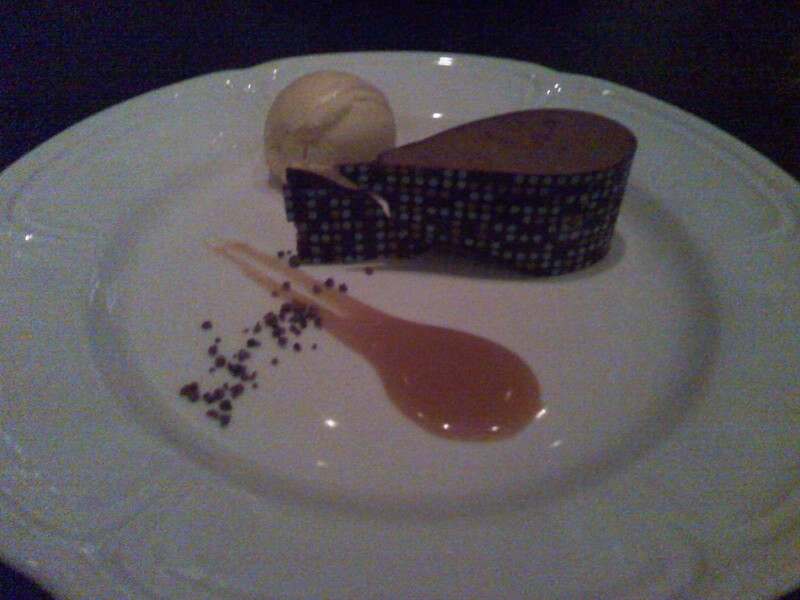 Overall, Sepia still resides towards the top of my list for best restaurants in Chicago. Last night’s meal wasn’t perfect, nor was the service as we had to ask for bread (should have been put down as soon as we ordered, but that’s nitpicking), but the ingredients were fresh, perfectly cooked, and for the most part thoughtfully prepared. I will definitely head back at some point.